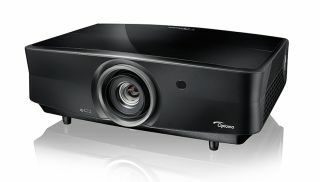 Optoma announces new flagship 4K Ultra HD projector | What Hi-Fi? The UHZ65 is a 4K HDR projector based on the tech of the company's award-winning UHD65, and will set you back £5000. Optoma, a manufacturer whose 4K HDR projector recently won a What Hi-Fi? Award, has just announced a new flagship projector based on its tech - the UHZ65. The UHZ65 uses the same pixel-switching techology to put the required 8.3million pixels on a screen needed to meet the 4K standard, and is HDR compatible for a greater colour range than standard Blu-rays. You get a couple of HDMI inputs and a powered USB port - so you can connect up a Google Chromecast or Amazon Fire TV device for smart-viewing. But this new projector has greater luminosity - with 3000 lumens over the UHD65's 2200 - and a better contrast ratio at a claimed 2,000,000:1 (rather than 1,200,000:1). There are also the expected motion-processing modes for smoother frame interpolation, and a reference mode that recreates the DCI-P3 colour space used in cinemas. Prices start at £5000, with the projector becoming available later this month.